Electro Acupuncture is stimulation of certain acupuncture points by low level electrical current for certain medical benefit. 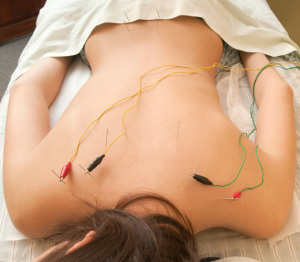 The needles are inserted on specific acupuncture points along the body. Electroacupuncture uses two needles at time so that the impulses can pass from one needle to the other. The needles then attached to a device using small clips and that generates different electric pulses. Devices adjust the frequency and intensity of the impulse being delivered, depending on the condition to be treated. Several pairs of needles can be stimulated simultaneously for about 20 minutes. Because the current delivered through the needle stimulates a larger area than the needle itself. Therefore practitioner does not have to be as precise with the point of insertion of needles. Moreover Electroacupuncture can be employed without using technique called trans-cutaneous electrical nerve stimulation, or TENS. It uses electrodes that are taped to the surface of the skin instead of being inserted. People with phobia of needles can use this method. It has been effectively used as a pain reliever for muscle spasms; and a treatment for neurological disorders, as a form of anaesthesia. Other studies have examined the role of Electroacupuncture in treating acute nausea caused by cancer medications skin conditions such as acne and renal colic. Electrical stimulation of acupuncture points could lower blood pressure and reduce heart disease as it activates the endorphin system. There is no pain or even discomfort. You may experience a tingling or numbness sensation while being treated with Electroacupuncture, due to the electric current. We gradually increase intensity of current from zero till when you start feeling the tingling sensation. We will keep level to comfortable level you want. Electro-acupuncture is a specialized therapeutic method in which a small electrical charge is applied to needles that are already inserted into specific points and have attained De Qi. Electro-acupuncture is advantageous in treating conditions that benefit from acupuncture and electrical stimulation. Val Hopwood PhD FCSP Dip Ac Nanjing, Clare Donnellan MSc MCSP Dip Shiatsu MRSS, in Acupuncture in Neurological Conditions Electroacupuncture in neurological conditions Electroacupuncture has been used widely for neurological conditions in China and has also been used in many of the research trials on acupuncture for stroke. In practical terms electroacupuncture seems to be useful for sensory and motor problems. Evidence shows that lack of afferent information from areas of impaired sensation or movement results in reorganization of cortical maps. Interventions to increase somatosensory stimulation are being used increasingly to influence sensory and motor function, with promising results in some studies . Electroacupuncture could provoke a strong stimulus in this regard, providing afferent information from skin and muscle contraction. 1. Points close to the medulla such as Du 15 (Ya Men) and Du 16 (Feng Fu). 2. On the lower lateral line of the occipital area, use caution with the intensity of current used. Choose the right amount of current so that the patients feel comfortable. Take care not to increase the current suddenly or in large amounts, because there is a dangerous possibility that it can cause the heartbeat or breathing to stop. 3. Electro-acupuncture is contraindicated for patients with cancer or severe heart disease. 4. During the treatment, the practitioner should be careful not to bend or break the needles. Electro-acupuncture shares the same range of indications as filiform needling, so it can be used to treat a broad spectrum of conditions. The most notable conditions are all types of pain; Bi syndromes; Wei syndromes; disease conditions of the stomach, intestines, gallbladder, urinary bladder, and uterus; and injuries to the muscles, ligaments, and joints. It is also used in acupuncture anesthesia. The micro-acupuncture system is widely used in electro-acupuncture, especially in the scalp acupuncture system, Jiaji acupuncture system, and back Shu system. There are good results when using electro-stimulation for central nerve disorders, especially with scalp acupuncture. It is also common to combine electro-acupuncture with the macro-acupuncture system. There are many different waves to choose depending on different conditions. This wave features a continuous frequency of from 50 to 100 pulsations per second, making it a relatively high-frequency pulsating current. It is able to decrease nerve reactions to produce controlled results, making it effective in stopping pain. The dense wave can also release muscle spasms and vessel spasms, making it beneficial in the treatment of circulatory problems and nervous tension. This wave features a continuous low-frequency pulsating current. The amount of time between pulsations is sufficient to prevent accommodation of the tissues, allowing continual stimulation of the affected area. The sparse wave is used to provide stronger stimulation resulting in a vibrating sensation or muscle contraction. Sparse wave therapeutic effects are also known to last longer than those of other waves. This wave combines the dense wave and the sparse wave, alternating between them about every 1.5 seconds. It is very difficult for the body to accommodate to this combination wave, so it is able to produce a strong reaction capable of exciting the nervous system, increasing metabolism, aiding circulation, improving nutrient uptake in the tissues, and helping the absorption of edema. The pain-control effects of this combination wave are also known to last a long time. This wave is clinically used for treating high blood pressure or any acute injury such as a sprained ankle, joint inflammation, muscle weakness, nerve pain, sciatic pain, and Bell's palsy. This wave features a pulsating current in an “on-off” pattern. There is a 1.5 second timeframe without any pulsating current when it is “off” and 1.5 seconds of stimulation with a dense wave when it is “on.” The intermittent current is difficult for the body to accommodate. The intermittent wave is capable of providing powerful stimulation resulting in a strong sensation and muscle contraction. Clinically, it is mainly used to treat paralysis and conditions of muscle weakness. This wave's frequency is very stable and its pulsating current acts like a saw, occurring 20 to 25 times per minute. The frequency of this wave's pulsations are very close to that of the human respiratory rate, so it is commonly used to stimulate diaphragm nerves to assist artificial breathing. The serrated wave is known also to increase nerve-muscle activity, adjust vascular function, increase circulation, and help with fluid absorption. Normally a dense wave or dense-sparse wave is used to stop pain. Use a dense-sparse wave to increase circulation, in addition a dense-sparse wave or serrated wave is used to increase absorption of fluid. Use the intermittent wave, serrated wave, or sparse wave to increase muscle activity. A sparse wave is used to stimulate connective tissues. When using electricity, choose a pair of points on one side of the body's midline. After setting the electro-machine's output to zero, apply the negative electrode to the main point and the positive electrode to the secondary point. Select the desired wave form and turn the electro-machine's power on, slowly increase the output until it reaches the desired level. Generally, electro-acupuncture is applied for 5 to 20 minutes. The appropriate amount of stimulation falls between the current of sensation threshold and the current of pain threshold. This is a very subtle range that needs careful adjusting to suit the patient and the treatment without causing needless discomfort. It is vital that the electrical path/circuit does not cross the heart or medulla. Inspect the electro-machine (e.g., contact wires, dials, settings, and batteries) before each use. In addition, turn the output off to zero before use. When regulating the intensity of the electrical charge, any increase must be performed slowly and carefully. 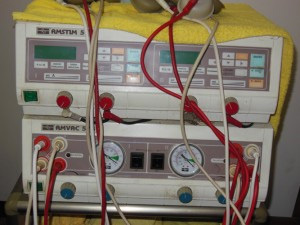 A sudden, rapid increase in the intensity of the electrical current can cause an abrupt, painful muscular contraction that may result in a bent or broken needle, or even cause the patient to faint. To avoid causing a short, do not allow the paired needles to come into contact with each other. Electro-acupuncture is contraindicated for patients with cardiac pacemakers. Use caution with electro-acupuncture in pregnant women; in the area near or directly around the heart; near a recent scar, new skin, or cut; and directly over, through, or near a recently fractured bone. Electroacupuncture (EA) involves running a small electrical current through needles of sufficient intensity (at least, in laboratory experiments) to make the muscles twitch. Most laboratory research into acupuncture uses EA since it is a reproducible stimulus. Broadly speaking, different frequencies of EA release different opioid peptides. We owe much of our knowledge on this subject to Ji-Sheng Han, who noticed that acupuncturists vary the way they stimulate needles with spinning or thrusting manoeuvres, sometimes fast and sometimes slow. Han chose the frequencies of 2 Hz and 100 Hz to represent the extremes. He showed that 2 Hz stimulation induces analgesia by release of β-endorphin, enkephalin and orphanin, and their effect on μ receptors; and that high frequency stimulation (typically 80–100 Hz) releases dynorphin, which stimulates κ receptors . EA of 15 Hz induces a limited release of both enkephalin and β-endorphin. In a comprehensive review of this laboratory work, Han suggests that the greatest short-term analgesic effect is achieved by combining 2 Hz and 100 Hz (Han 2004). Clinical research in patients with pain has suggested that the effect of 2 Hz is longer lasting than that of 100 Hz (Thomas et al 1995). Different opioid peptides are released by different stimulation frequencies. For electroacupuncture, use the needling techniques described in the previous section to detect the appropriate ear points and to insert needles into the skin. In order to hold the inserted needles securely in place, tape the needles across the ear with medical adhesive tape. Without this tape, needles will tend to pull out the external ear when you attach the stimulating electrodes; the electrodes need to be held in place with protective tape. Fasten the electrode leads securely in place, either to the patient’s clothes or to office equipment. Use microgator clip electrode leads from an electronic stimulator to connect to the inserted needles . Because these moveable clips may pull out the inserted needles when attached, one must make sure that the needles are first securely taped in place. It is also wise to fasten the electrode wires to a secure anchor so that these wires will not drag on the needles and pull them out by accident. One always needs to stimulate between two needles because electricity flows from a positive pole to a negative pole. It does not usually matter which pole of the stimulator is attached to which ear point, but if the patient reports any increase in pain, one can try switching the electrode leads to the opposite polarity. Preset the electrical frequency rate to either a slow 2 or 10 Hz frequency or to a parameter known as dense–disperse, in which 2 Hz frequencies are alternated with 100 Hz frequencies Lower frequencies (10 Hz or less) most affect enkephalins, endorphins, and visceral and somatic disorders, whereas higher frequencies (100 Hz or higher) affect dynorphins and neurological dysfunctions. Gradually raise the electrical current intensity to a perceptible level and then reduce it to a subpain threshold. The electrical stimulation intensity should not be overly uncomfortable. As with auricular acupuncture without electrical stimulation, leave the needles in place and maintain the stimulation current for 10–30 min. Treat the patient one to three times a week for 2–10 weeks. Although more cumbersome to apply than needle insertion alone, electroacupuncture is typically more powerful and more successful in relieving pain and alleviating the problems of addiction. Acupuncture and electroacupuncture have been found to be useful for neuropathic pain. Because beta endorphins are involved in the pathogenesis of both painful and painless neuropathy, acupuncture may exert its well-known effect by stimulating the production of endorphins in the central nervous system. Although acupuncture cannot easily be explained by known neurophysiological mechanisms, several studies have examined the effects of acupuncture in the treatment of various types of peripheral neuropathy, including diabetic, HIV-associated, chemotherapy-induced, and neuropathy of mixed origin. In randomized controlled studies, case series, and sham studies, acupuncture was shown to improve nerve conduction velocity, decrease numbness and pain (66%–87%), and improve symptoms more effectively than conventional medical treatment in peripheral neuropathy induced by chemotherapeutic drugs (66% vs. 40%), especially in moderate and severe sensory nerve disorders. In some cases (67%), patients were able to reduce or stop their pain medications. Neuroacupuncture has a positive effect on neuropathic pain and often results in the ability to reduce or stop pain medications. Patients can receive six courses of classical acupuncture analgesia to both lower limbs over a 10-week period. In addition to classical acupuncture, a small, clinical, pilot study of biweekly electroacupuncture treatments for 4 weeks demonstrated a reduction in continuous pain from 32.9% to 15.9% and a decrease in the intensity of pain attacks from 59% to 44%. Electroacupuncturemay have a positive influence on nerve conduction velocity and may also relieve neuropathic pain. Electroacupuncture is performed in two cycles of five sittings each (10 sessions) at 2-day intervals. Most clinical studies provided one to two treatments per week for 10–20 weeks. There is clinical evidence that an acupuncture subspecialty called neuroacupuncture (Chinese scalp acupuncture) has remarkable effects on central nervous systems disorders. A more comprehensive mixture of body acupuncture and neuroacupuncture (with or without electrical stimulation) can improve clinical outcomes by using the following protocol. In my clinical experience, this works very well. Neuroacupuncture points are the upper one-fifth sensory area (S 1/5) for the lower limbs, middle two-fifths sensory area (S 2/5) for the upper limbs, and foot motor and sensory areas; ear points: ShenMen, sympathetic, foot; body points: GB-40, GB-34, SP-10, SP-6, ST-44, LR-3, and Bafeng (extra point). Electrical stimulation can be used for the ear and body points at a frequency of 100 Hz at low intensity for 10–15 minutes in order to achieve an enhanced response. Before such therapies can be recommended, a constitutional evaluation by a practitioner who is trained in acupuncture, or more specifically neuroacupuncture, should be considered because each modality is prescribed on the basis of the unique symptoms and physical characteristics of the patient. A comprehensive review of medical acupuncture and scalp acupuncture for physicians may be found in the various texts by Dr. Joseph Helms and Dr. Jason Hao. Properly performed electroacupuncture treatment can be, perhaps, the most effective antinicotinic therapy. In our clinical material of dozens of patients with nicotine addiction, we have achieved an approximate 85% success rate of permanently ending an intensive smoking habit. The most recommended classical APs to be stimulated in the case of nicotine addiction, subject to tenderness and “Acute”/“Subacute” readings on the OED device, are as follows (Figure 5.79): T 15 (can be stimulated bilaterally with TENS), G 43, G 8, P 6, L 7, and GV 20. However, an additional (nonclassical) AP called Yintang should also be used; it is located on the Governing Vessel (GV), between the eyebrows. For “heavy” smokers, another two “extra” points can be added, which are located symmetrically on the outer sides of nostrils on the verge of nasal bones. The recommended antinicotinic therapy also includes a very important auricular acupuncture: on the left ear auricle, OPAs corresponding to the bronchi and the stomach should be stimulated (see Figure 4.8); on the right one, OPAs related to the lungs (lower lobes) and the gallbladder should be stimulated. Auricular electroacupuncture can be done with small standard needles (3–4 cm long), which can be connected to the electrostimulator (see Section 5.8.1.2.3) along with all the other needles inserted into corporal APs. This treatment seems to block the nicotinic hunger. Therefore, 10 minutes after the beginning of such a stimulation, the patient (still under treatment) should be asked to smoke one or two cigarettes; this will be like the first cigarette in his or her life, with intensive perspiration, dizziness, nausea, and sometimes vomiting and even fainting occurring before the smoking is finished. Then, following the famous example of Pavlov’s dogs, the same procedure should be repeated three times per week, at least several times, until the patient develops a reflex permanently preventing him or her from attempting to smoke. Manual acupuncture and electroacupuncture have been reported to result in measurable responses in the nervous system, including modulation of neurotransmitters and other endogenous substances (Ma, 2004). Investigation of a physiological mechanism of action of acupuncture has focused primarily on its analgesic effects. Earlier studies suggested that acupuncture analgesia is mediated by endogenous opioid peptides, with several studies demonstrating a block of the analgesic effect by naloxone, an opioid antagonist (Lin & Chen, 2008). Various endogenous substances have been suggested as mediators of the analgesic effects apparently elicited by acupuncture. These include serotonin (5-hydroxytryptamine), catecholamines, and gamma-aminobutyric acid (GABA) (Ma, 2004). Opioid peptides at mu-, delta-, and kappa-receptors are considered to play a pivotal role, but glutamate and cholecystokinin octapeptide are also thought to be involved (Zhao, 2008). Further evidence for the complexity of the effects of acupuncture was provided by a recent neuroimaging study, which indicated that multiple responses continue after needling has been terminated (Bai et al., 2010). The precise role of each of these substances in generating the effects of acupuncture is still to be fully elucidated and the implications for psychiatric disorders are less well defined and understood. Often described as electroacupuncture, this technique was first developed in China in the 1950s to provide adjunct anaesthesia to reduce the amount of pharmacological anaesthetics required during surgery. PENS is now recognised to have anaesthetic and nerve regenerating functions. It is widely applied in daily practice and in clinics for the treatment of various types of pain, in which postoperative pain is one of the main indications. PENS is typically applied using milliamps of current; microamps may also be used. Acupuncture points or areas may also be electrically stimulated without needle insertion. TENS uses conductive pads placed on the skin to deliver electrical signals to nerve fibres transcutaneously. The effect of transcutaneous electrical nerve stimulation does not extend as deeply into tissue as percutaneous electrical nerve stimulation, which has the same anaesthetic effects, primarily at the level of skin and fascia. However, this modality may be preferable in clinical scenarios where needle puncture is not well tolerated or is inadvisable due to contraindications. Basically, this method of electric acupuncture uses the same principles as conventional acupuncture. The only difference is that an electric signal, similar to the actual nerve impulse, is used to stimulate the channels. Under certain conditions this is the preferred choice of therapy. The TENS unit measures skin resistance, which is generally lower at the specific acupuncture point. Once the spot has been found, a steady electric impulse is passed onto the body channel. The strength of the impulse can be set. The patient has a tingling type of sensation, like ‘pins and needles', which is usually felt along the channel. Microcurrent electrical therapy is also known as microamps of electrical therapy – MET for short. Current may be provided via inserted needles, hand-held probe electrodes or self-adhesive electrodes. Unlike TENS, which is thought to close the spinal gate to pain impulses so they will not ascend to the brain, MET is believed to have a strong anabolic healing response, with up to 500% increase of adenosine triphosphate (ATP) into the treated area following a treatment of 1 hour or less, increased movement of amino acids into the area and an increase in protein synthesis at the site treated. This is the application of low-level electrical stimulation across the head via ear clip electrodes. It is currently a Food and Drug Administration approved therapy in the USA for some diseases (e.g. depression, anxiety and insomnia). It has also been used effectively to treat various types of postoperative pain, especially chronic pain (e.g. spinal pain, headaches, dental pain, etc.). Due to its potential anaesthetic effect, it is also used in general surgery, thus requiring significantly less medication to keep the patient anaesthetised. As well as its application to relieve postoperative pain, this technique can be used as a drug-free treatment for anxiety, depression and insomnia after the operation. Its mechanism of action is widely thought to be its ability to bring neurotransmitters in stressed subjects back to normal, pre-stress levels of homeostasis.